Prcn is a promoter that is activated by cobalt. The RcnR repressor binds to the promoter by default. When enough cobalt molecules accumulate in the cell cytoplasm, the cobalt ions bind to the RcnR repressor and prevent its fixation on the rcn promoter. Prcn is also activated by nickel, but we have not characterized this aspect. Important : this characterization hasn't been done with this biobrick and an iGEM Gfp. It has been done with the wild type promoter. The part we provide contains the exact sequence of the promoter but a silent mutation to remove a PstI site. The GFP used here, is a stable GFP. NM522/p157 where p157 is a plasmid containing a fusion Prcn-stable GFP (= pPROBE OT′ carrying the gfp coding sequence under the control of the rcnA promoter, described in Appl Environ Microbiol. 2009 March; 75(6): 1723–1733). NM522/p115 where P115 is the control plasmid pPROBE OT′. Both strains are cultivated with (25µM) or without cobalt. 1ml of bacteria is added to a mix of 100ml of M63G medium + 1ml of spectinomycin in a 250ml erlen. The erlens are put in a 37°C bath with a 270rpm agitation. 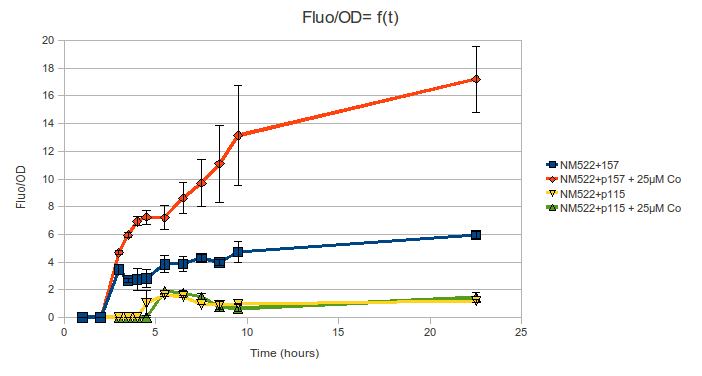 Every hour, a 3mL and 1mL culture sampling are done for a fluorescence measurement and an OD(600nm) measurement respectively. As we expected a peak of expression during the early exponential phase (personnal communication of Camille Bleriot),samplings are done every half hour during that time. The measurements are stopped when the OD reaches 1. A last sampling is done after an overnight growth. The experiment has been performed in triplicate by 3 different students during the same day. The results shown below are the mean values obtained from the 3 operators. This graph shows that the strain NM522/p115 (carrying a control plasmid) exhibits only residual fluorescent activity and does not respond at all to cobalt. Whereas the strain NM522/p157 (carrying a plasmid with GFP under the control of rcn promoter) responds spectacularly well to cobalt: a drastic increase of the fluorescent specific activity is observed in presence of the metal. Moreover, we observed that a fluorescent activity of the Prcn-gfp can be detected even without added cobalt (induction factor of 3 rsulting from cobalt addition). This probably results from the leaky nature of the promoter rcn(Camille Bleriot, personal communication). Our characterisation of rcn promoter shows that this promoter is inducible by cobalt. Kinetic analysis of the promoter allowed us to establish that an OD(600nm) of 0,2 was optimum for rcn promoter activation. To conclude, this work shows that this promoter can be used with efficiency in a cobalt sensitive system. NB : Corroboring results of this characterisation can be seen on the main page of an other part characterisation, the part BBa_K540000,here. Further experiment : In order to check that the cobalt's activation is selective to the rcn promoter, an other kinetic mesurment is done with a MC4100 strain transformed by a plasmid containing the pLac promoter fused with a GFP. Culture condition : 100ml of M63G medium + 1ml of an overnight culture + 1ml ampicilline in a 250ml erlen. 37°C and 250rpm. 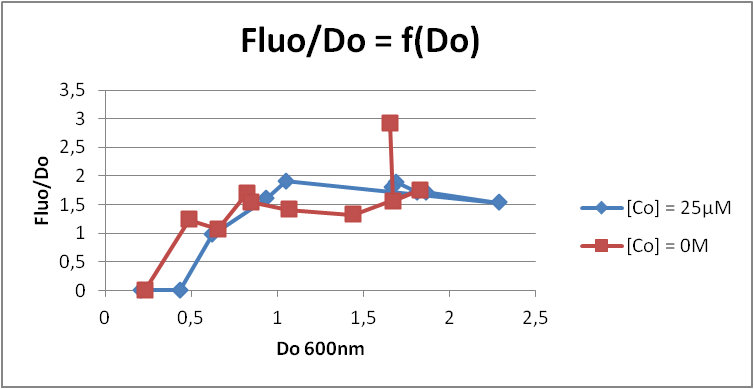 Every hour, a 3mL and 1mL culture sampling are done for a fluorescence measurement and an OD(600nm) measurement respectively. These results show that cobalt hasn't activated the pLac promoter. So, the cobalt activation is specific to the rcn promoter. This part is not toxic by itself. However, when using this part, you will probably need to handle cobalt. Cobalt is toxic in all its forms ( ionic or metallic ) by inhalation, ingestion or contact. Wear adapted personal protection equipment ( labcoat, safety glasses, safety gloves ) and dispose of it in appropriate waste containers.